The Beach has lost one of its brightest artistic stars. Jennifer Cline, known as much for her technically proficient watercolours as her omnipresence on Queen Street with her fiery red hair and trusty bicycle, passed away peacefully on July 27 after a six-month battle with brain cancer. 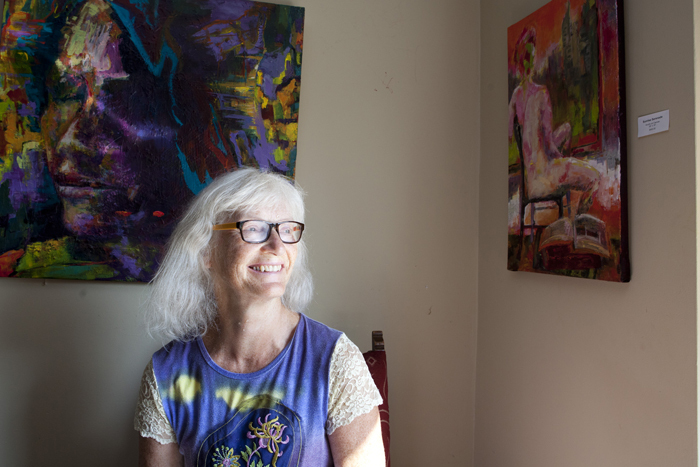 Cline is well-known to long-time Beach residents, artists and art lovers, having painted her much-beloved neighbourhood for decades. She was a founding member of the Beach Guild of Fine Art, alongside Wynona Gallop, Shirley Jones, Mary Cserepy, the late William Taylor, Carolyn Pack, and Janice Gibbins. 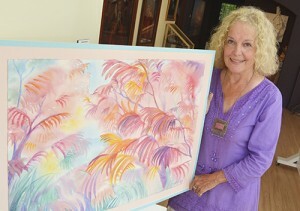 Both solo and with the Guild, Cline exhibited her work in numerous galleries, including many shows at the Beacher Café and 15 years as part of the Beach Studio Tour. Valerie Cline, Jennifer’s niece, said her aunt symbolized the neighbourhood she loved and lived in for more than three decades. Jennifer treasured the trees, parks, architecture and character of the Beach, said Valerie. “I know she really passionately wanted to preserve that,” she said. Cline painted many of the shops along Queen Street over almost 40 years, building a legacy of images of that very character she treasured, and her art has in many cases outlasted the businesses she painted. Along with Queen Street and the Jazz Festival, her floral and historical paintings are equally treasured records of the past. 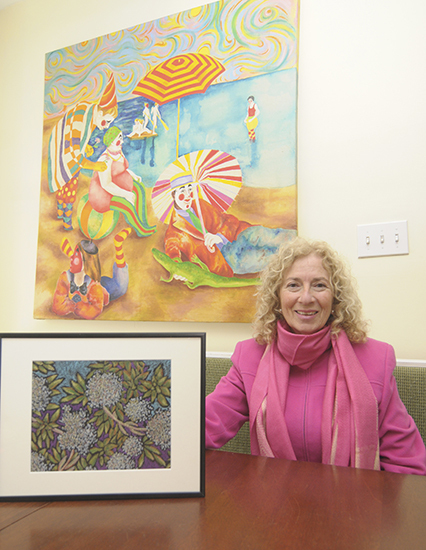 She has been commissioned to commemorate significant anniversaries at the Balmy Beach Club and Community Centre 55, and was generous with contributing her work to local causes. Cline trained at the Ontario College of Art on a scholarship from the Eagle Pencil Company, one of only two ever given out. She worked as a commercial artist for companies such as the Cockfield Brown Agency, Eaton’s and The Bay, where she honed the technical proficiency some might not even know she had. Valerie said sorting through her aunt’s old work, some dating from as far back as her high school years, was something of a revelation, revealing a mastery of everything from catalogue and fashion work to architectural drawing and even caricatures. 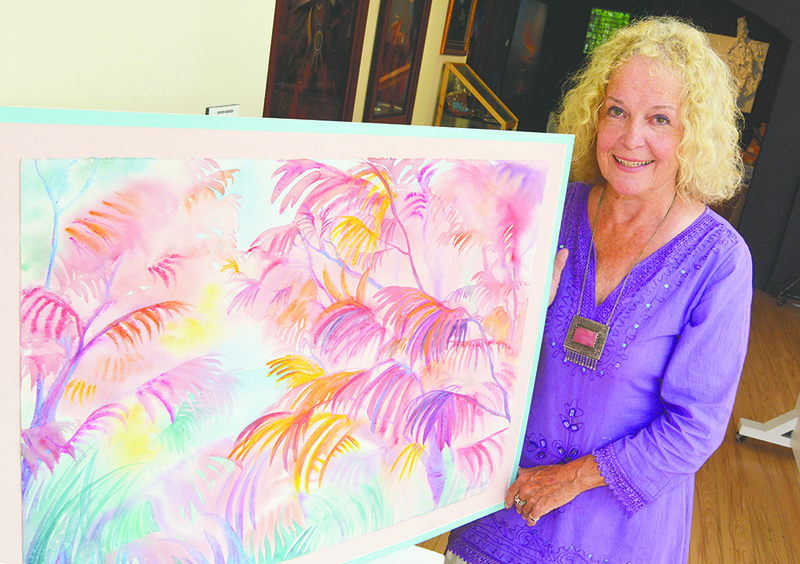 When Cline gave up commercial work for fine art, business became something of a lower priority, and she often donated her time and talents, said Valerie. The Beach was not just Jennifer’s home, it was also her muse, said Valerie. In a 2014 interview with Beach Metro News marking the Guild’s 20th anniversary, Jennifer stated as much. After discussing all the spots she’s painted around the world – Greece, England, Colombia, France – she said she still always returns to her favourite place to paint: home. “That expanse of sea and sky at the end of the street, where else do you get that in Toronto?” she asked. A private ceremony has taken place, but Valerie is hoping to organize a chance for Beachers to celebrate Jennifer’s life. Email her at valerie.cline@gmail.com to share condolences and to stay informed on memorial plans. She found the perfect place on Blantyre, and has lived there for the past four years. Her home is a compact semi with an interior that has been transformed so that what was once a large bedroom at the rear of the house, is now her bright studio space. The floor in this space is covered with a protective vinyl matting to absorb paint drippings, the large south-facing window is draped with a white sheet which softens the bright natural sunlight. Several half-finished canvases are scattered about the room, and one on the easel bears a strong resemblance to the artist herself. She admits to experimenting with a self-portrait, and points to the mirror on the opposite wall. Some of Jensen's most striking works involve portraits of a sort. They are larger-than-life, brightly coloured acrylics (her sole medium) that are so impressionistic as to almost be abstract. You sometimes have to look twice to find the face in the piece. “I start with a live model to get at the piece's core structure,” she said. Then she will set the canvas aside for awhile and work on another. “I need to establish a communication between myself and the canvas. 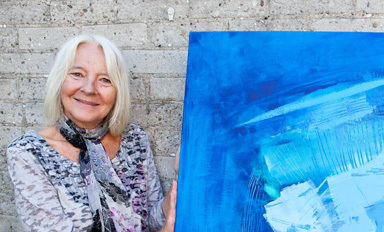 She illustrated her point with one of her popular paintings of Toronto streetcars. The viewer cannot see the route number or name clearly, the lighting is dark and the background is hazy, so that it’s unclear where in the city the street car is. There are no recognizable landmarks – storefronts, street signs, nothing. “I've only had one person who actually knew where the painting was from,” Jensen said. One of the things that drew Jensen to this area was the number of artists who live here. She spent three years on the waiting list before joining the Beach Guild of Fine Arts, and has, along with fellow artists Felicity Somerset and Callie Gray, formed LuminArt, a smaller collective of East End artists. She also holds life-drawing sessions in her home studio every Thursday. There's a live model, and two three-hour sessions; one in the morning and one in the afternoon. Jensen will be part of the Beach Guild of Fine Arts’ annual Art Down by the Bay exhibition, Sept. 21 to 23, at the Beaches Lions clubhouse at the foot of Coxwell. This year marks the 18th anniversary of this popular fall art show and sale. More than 40 artists will be showcased in two exhibition halls. The upstairs space will be full of large, original works of art. Many of the artists will be on hand to chat. The downstairs space is devoted to smaller originals (usually unframed), prints, gift cards and the like. This is a great place to buy gifts, or begin a collection of works by Beach artists.